During major incidents, stakeholders including customers, executives, partners, and others who also demand frequent status updates. Part of your major incident response plan needs to focus on initiating and developing communication with these key players. Major IT incidents can cripple your company in the short term and cause long-term issues as well. If your company suffers from a major tech incident, you need to organize response teams to limit the damage, resolve the incident, and protect your brand. While that’s going on, there are other stakeholders who don’t help resolve incidents, but they still demand frequent status updates. They include customers, executives, partners, regulators, customer representatives, website managers, and others. Your major incident response plan needs to focus on initiating and developing communication with these key players. We surveyed more than 760 IT professionals in 2018, and they confirmed that keeping “non-essential” stakeholders informed has a major impact on their ability to resolve major incidents. Identify who your key stakeholders are so you can contact them quickly. Once you have determined who your stakeholders are, prepare to automate notifications. Word gets out quickly and customers start letting you know pretty much immediately when your service is unavailable. Automating the identities and contact information of your stakeholders is fairly obvious. Manually communicating with stakeholders is way too time-consuming and error-prone. But to help mitigate the damage of downtime or service degradation, you should also automate the content and frequency of communications during major incidents. Unfortunately, the xMatters survey reveals that too few organizations are employing automation in their communications. Service desk tickets include event details from monitoring systems. That information is crucial for incident resolution team members to do their jobs. That’s why with xMatters, your service desk technicians can import crucial details directly from the ticket into notifications to resolution team members. They can also automate the inclusion of a less technical message for outside stakeholders like customers, and for internal stakeholders like executives. They can set updates to send at regular intervals. But sometimes that isn’t enough. So you can use an xMatters integration with Statuspage to update conditions where your stakeholders can check it out any time they want. This takes pressure off your employees and satisfies people who need know what’s going on. Self-service status updates also reduce inbound calls from customers, which can distract resolution team members from doing their jobs. No matter which products and services you use, you can use xMatters to enhance your response and mitigation processes, as you can see in the video below. 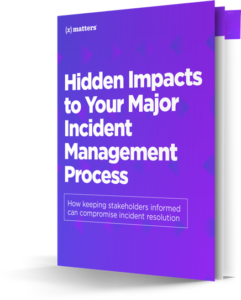 When the major incident is over, investigate the causes of the major incident and come up with specific actions to prevent it from happening again. Document remediation steps, how effective they were, and what you can do better. xMatters can save chat transcripts and other important records from the incident in the system of record, a service desk or incident management system. Statuspage and final messages can deliver information about causation and remediation to stakeholders, but be sure to make your communications appropriate to your audience. Your company should also be prepared to answer any stakeholder questions in order to reassure them that all reasonable actions are being taken to address system weaknesses. Those stakeholders who suffered as a result of your tech issue deserve to understand what happened. You will have to help them trust your once more. Your company will experience a major incident at some point. No business can go unscathed indefinitely. Managing major incidents requires a comprehensive strategy employed by a response team with a communication plan. Stakeholders need timely information so they can adjust their own business practices. They need to know that you are working to correct the problem and that you are exploring preventative measures as well. Learn more about how xMatters leverages integrations to deliver a better experience to your stakeholders during major incidents. Try xMatters free today.